Bello l'abitino e ancor più bello il cardigan, splendida e perfetta in ogni dettaglio! Dear Lilli, a lovely outfit in these soft baby colors. I love those colors at winter. Very refreshing. 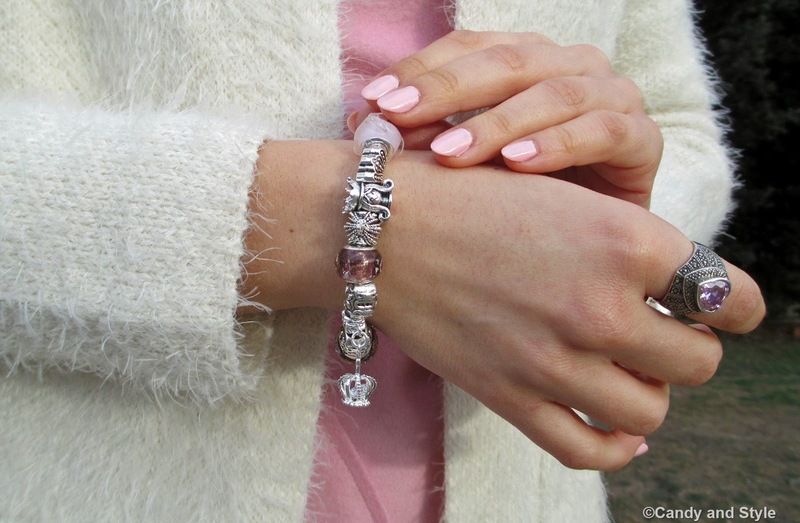 Your new bracelet matches perfect with your outfit. I'm still in love with is. Questo rosa mi piace tantissimo e con il bianco è ancora più bello. adoro il cardigan! sembra così soffice! Splendido il cardigan, carinissimi i bracciali e la collana! What lovely outfit!You look gorgeous dear! Love your soft pink dress!So cute! And the bracelet is my favorite too! Oh yes! This outfit remember me cotton candy, cute and chic, beautiful accesorios. I like the bracelet so much. Happy weekend Lilli. Love your outfit Lilli! It is absolutely gorgeous with the pink and white colors. You are also gorgeous! So pretty Lilli. Love the pink and white combination for winter. By the way, I don't ,ind a cotton candy once in a while. The necklace looks nice and simple. I love it! adoro questo look soprattutto per i colori che amo tantissimo. Stai davvero bene e lo trovo perfetto per San Valentino. Molto belli anche gli accessori, il bracciale è super e poi lo sconto è ottimo. Lilly mi puace moltissimo questo look e trovo che nuances come il rosa ed ilbisnco ti stiano veramente bene. Felice sabato sera, un bacio. Pink and white is so cotton candy and so so so so you! Happy Valentine's Day my dear Lilli!